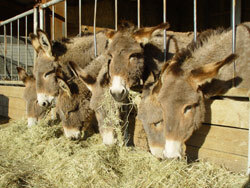 The donkey eats grass, but it enjoys thistles: its favourite menu. You will also see it eating nettles, but contrary to the thistles, it cuts them at the level of the roots when they start to turn dry. It is also an excellent "hedge trimmer" who will not neglect fibrous brambles, branches and all plants. In Normandy, its principal food will be of course a good grass during two-thirds of the year. If you need to contribute fertilizer to your ground, be careful to not put too much nitrogen. Do not hesitate to ask for information in an agricultural store, about the proportioning advised for equidaes. When the grass is too tender or too wet, it is better to give them hay in their rack for their intestinal balance. In the winter, the hay will be its principal food. But be careful do not overfeed your donkey except if is working (attachment, excursion...), or in period of covering for the stallions. You should not give food to the hand such as bread, carrots, delicacies, etc... The donkey will become vicious, and lead it to bite, which is completely contrary to its practices if it has a good education. Having an important breeding, I have used for about fifteen years a cover for the hay which is a special wrapping to keep it dryed, it is hay dry in a traditional way, put in rolls (approximately 300kg) and then cover with a minimum of four layers of plastic film to create a vacuum seal. This method has the advantage of preserving all the qualities in the hay, to be very appetizing and to allow very easy storage outside. When it is open, it is better to be consumed within three days so as not lose its qualities (goodness). 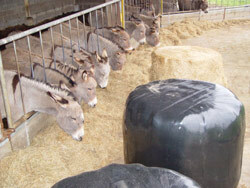 This system requires only a little labour but can be used only for breedings with ten donkeys or more. The donkey, like the human needs minerals. Also, it will be necessary to add to the contribution of vitamins in the form of stone's to be licked. To prevent the donkey from attacking the bark on the trees, it is desirable to also place a selenium stone at their disposal. These food complements are sold in the agricultural cooperatives or in stores specialized for equidaes.